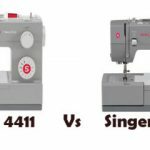 Janome DC1050 has been underestimated a lot. It is a study work horse. Most bad reviews online are because some people don’t follow the manual instructions thoroughly. 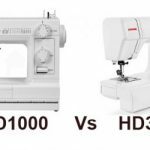 Janome DC1050 looks sturdy. Its built quality justifies its price to some extent. It is a computerized sewing machine. The stitch width and length are automatically adjusted for optimal sewing experience. It comes with 50 built-in stitches, the recommended foot for each stitch is displayed on the panel. 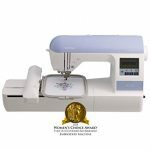 Janome DC1050 has a speed control slider which controls the speed at which the machine sews. A bright LCD screen is provided for viewing the adjustments made using the easy push button controls. It has needle up/down feature as well. It also comes with a button for lock stitch. You can do reverse stitches using the reverse button. You can adjust the stitch width and length as well. 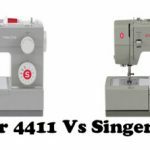 You don’t need a foot pedal to operate Janome DC1050 as it has a start/stop button for sewing. Work light LEDs are also provided, they are not that bright though, but it is just about enough. It has a top loading drop-in bobbin with a transparent cover. The transparent cover for bobbin lets you keep an eye on thread supply. Janome DC1050 has needle plate markings for all your seam allowances. 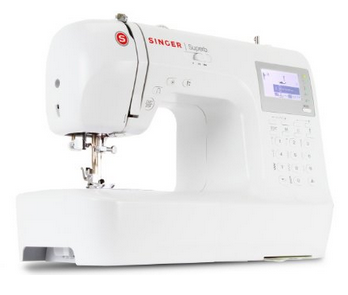 This sewing machine has free arm capability along with extra-high presser foot lifter for thick layers of fabrics. It has an automatic needle threader. There is a built-in thread cutter on the machine. Setting up Janome DC1050 was very easy as the instruction manual was very detailed and easy to read. It is very lightweight as well. Janome DC1050 works smoothly and quietly. It is one of the quietest machines I have ever come across. One thing I am really impressed with this sewing machine is that it delivers awesome straight stitches without even touching the fabric. This machine does a fantastic job in navigating up and over thick seams. The automatic buttonholes, make buttonholes perfect for the size of the button. If you wish, you can even do overcast stitches on Janome DC1050. This machine is extremely user-friendly. The zig zag stitches tend to bunch up at times. Some people have pointed out that the customer support from Janome wasn’t that impressive. 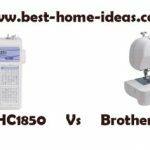 Overall, Janome DC1050 is a versatile and sturdy sewing machine. You can buy this machine if you don’t want to buy another machine for the next 10 years. I know people who want to upgrade their machines every two three years, if you are of that kind, this machine may not suit you. There is another Janome model which comes with a superior feeding system than this, Janome DC2011, but it costs few more dollars.